It is a criminal offence to drive whilst intoxicated to the extent of not being able to control your vehicle. The current general blood alcohol content (BAC) limit for driving is 50mg of alcohol per 100ml of blood. Lower levels apply to learners, recently qualified and professional drivers. See table below. 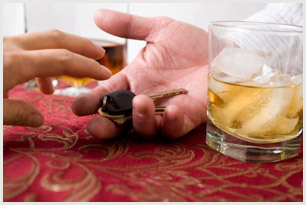 If you drink and drive you risk injuring yourself and others through your inability to control your motor. Remember – alcohol impairs co-ordination, judgement, vision and reaction time. Whilst you may believe you’re ok to drive, your actual ability to drive is still deemed impaired if you have been drinking. A Garda may stop a driver for a breath-test for certain driving offences, such as inconsiderate, careless and dangerous driving; you may have been involved in a traffic accident; or they may believe you have consumed alcohol. Any driver can also be stopped at a mandatory alcohol checkpoint for a breath-test regardless of whether they have made a traffic offence. The Gardai do not have the power to pull cars over whilst in traffic and breathalyse the driver at random. If you fail a breath-test, that is, if alcohol is detected in your breath above a certain limit – 35 microgrammes per 100ml of breath, and 9 microgrammes per 100ml of breath for Learner, recently qualified and professional drivers, the Gardai can arrest you and take you to court for a drink driving conviction. Blood or urine tests may also be carried out to assess alcohol levels in your body – the limits are included in the table below. If the Gardai take you to court they will have to prove that you drove, or attempted to drive, a mechanically propelled vehicle, in a public place, whilst intoxicated to the point where you were unable to control your motor. If you are convicted in court the penalties for drink driving that you face depend on the amount of alcohol that was found in your body (as determined by breath, urine or blood test) and whether you have been convicted for a similar offence in the past. However, all convictions carry a mandatory disqualification from driving. (c) Breath: More than 35microgrammes but not more than 44micorgrammes. As at present, and in addition to the above, you may have to pay a fine of up to €5,000 and/or face a prison sentence of up to six months, or both. As an alternative to court prosecution, the new Bill allows for an administrative fixed penalty system to be put in place for certain drink driving offences. This system means avoiding court in certain instances through fine payment and licence penalty points deduction. These administrative fixed penalties apply to the lower limit concentrations of alcohol and only for those drivers not currently disqualified from driving and not having used this fixed penalty option in the last five years.